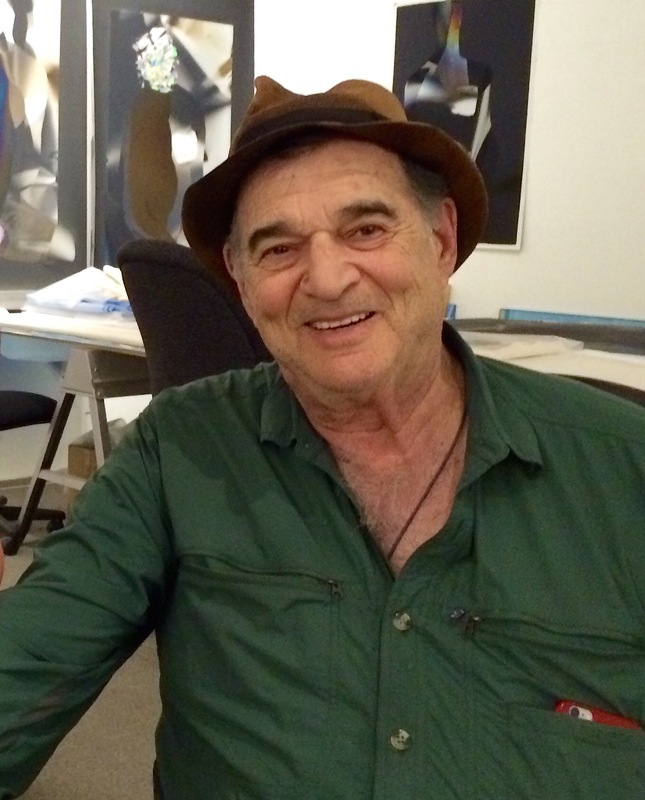 Taos is privileged to have as one of its residents world-renowned artist Larry Bell. 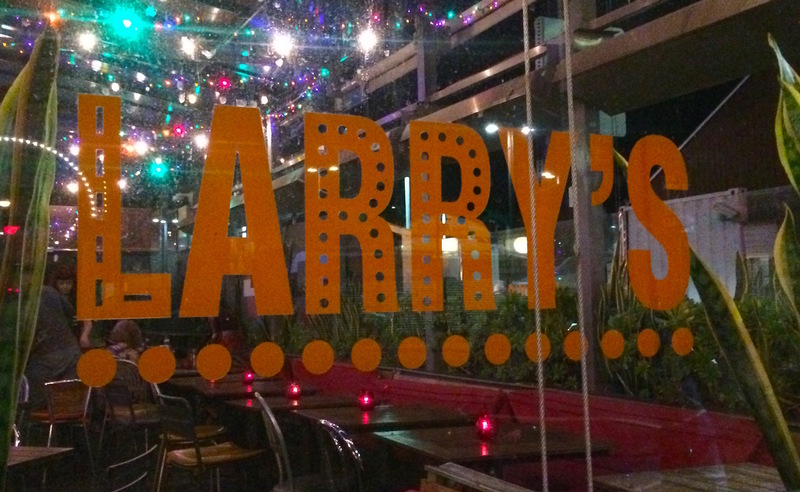 Larry’s work has been associated with the West Coast Minimalist movement called Light and Space. 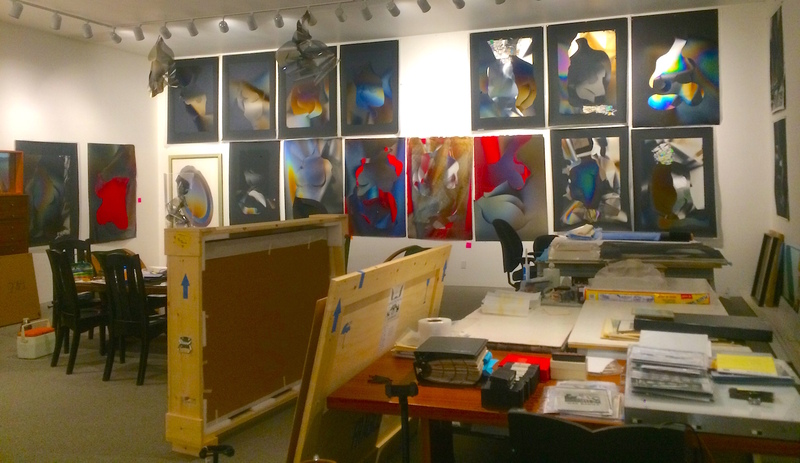 Larry Bell in his Taos, NM studio. Light and Space artists designed objects and environments concerned with perception and illusion often using industrial materials and finishes. Larry has been producing work and exploring a myriad of media and materials for more than 40 years. The artist has working studios in both Taos, NM and Los Angeles, CA commuting regularly between the two places. Larry’s work is featured in many major museums collections around the world. We shared tea and pecan tart at Larry’s studio in Taos where we were joined by the artist’s constant companion, his dog Pinkie. We had our Art+Tea conversation in the showroom portion of Larry’s studio with recent collage work hanging on the walls. These collages incorporate different materials with some coated by the vacuum coating process also used in the the artists sculptural glass work. Two light knots, made from coated mylar, also hang from the ceiling. 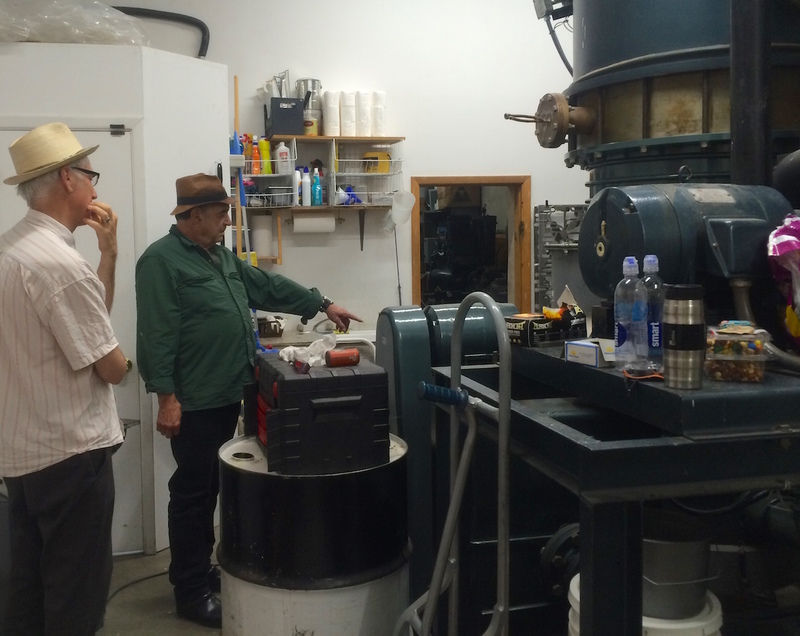 Larry gives us a tour of the studio which is filled with industrial equipment used for the vacuum vapor plating processes. 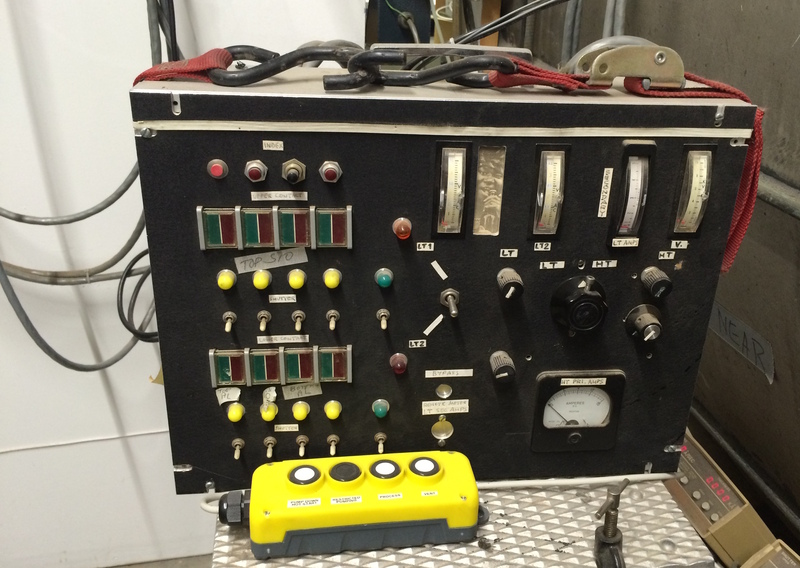 These tools have been used for many years in manufacturing processes and by Larry for more than 40 years. 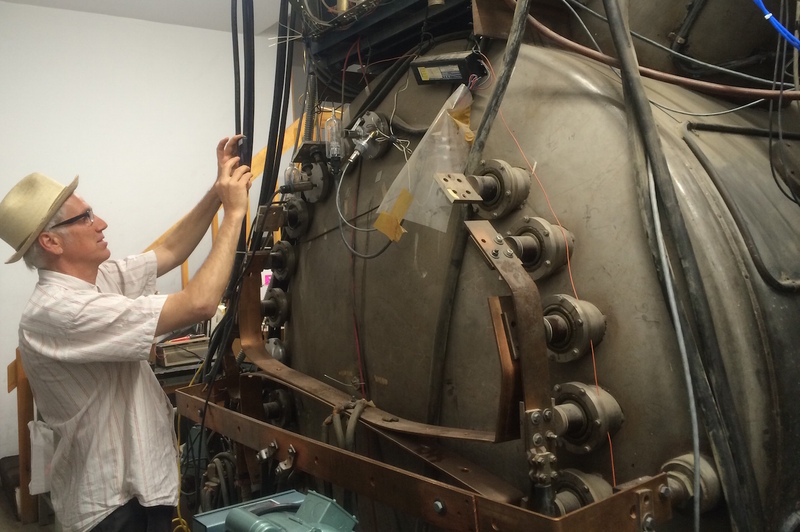 Very few people have experimented with different materials as Larry has, making him a unique expert. This 1975 sculpture shows the result of glass coated in the vacuum evaporator system seen above. The assembled glass transforms a space with imaginary dimensions created through the transparency and reflectivity of the plated glass. The results can be mesmerizing and sublime. This sculpture is in the Harwood Museum of Art collection. Gus’s Berg, 1975. 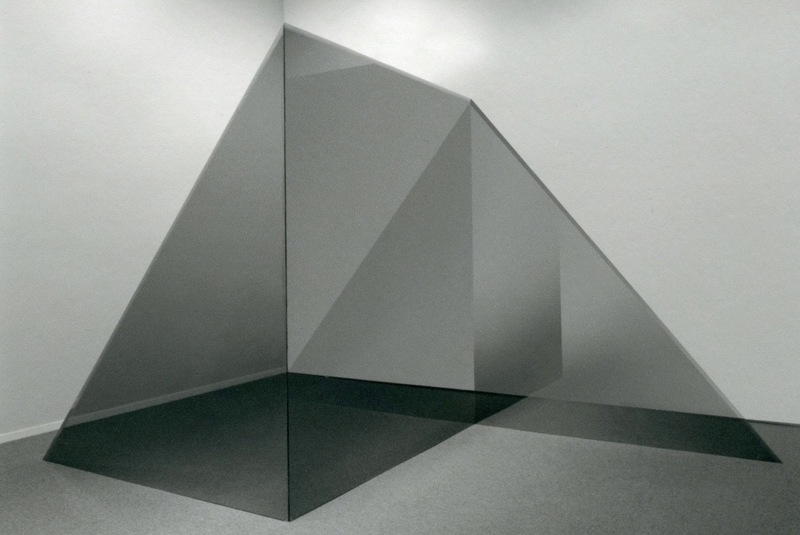 Coated glass panels: 6′ square; 6′ x 6′ triangles. Gift of Gus Foster. We loved the studio tour for all its tangible vintage devices and controls. 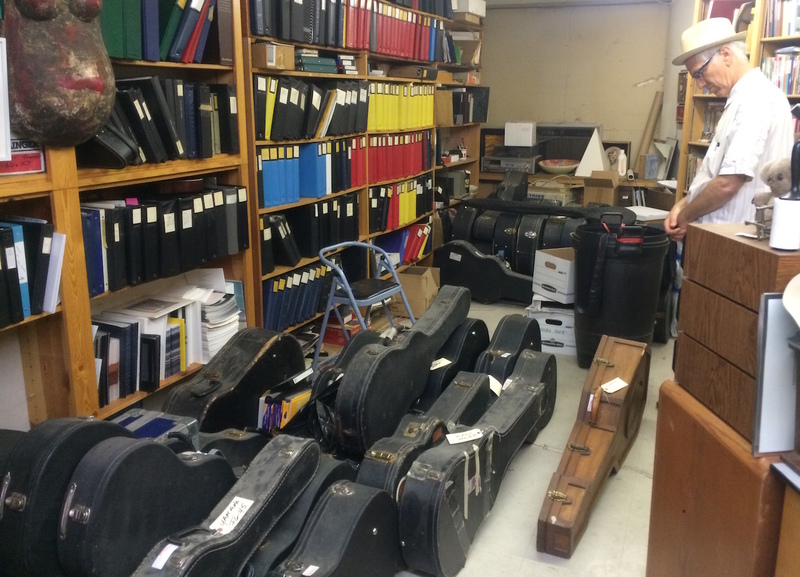 Many of the office spaces in Larry’s studio house portions of his large 12-string guitar collection. 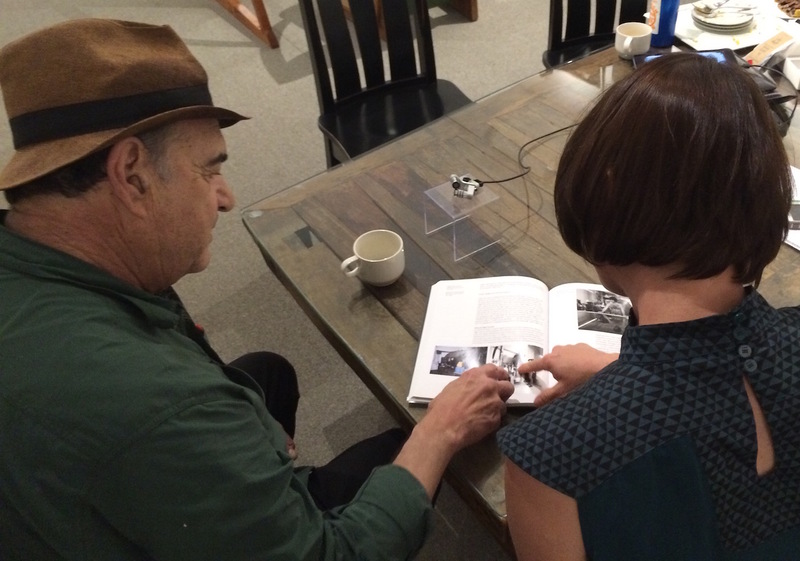 After the studio tour, Larry and Liz talk about old photographs as seen in the new book “Made in Los Angeles: Materials, Processes, and the Birth of West Coast Minimalism.” by Rachel Rivenc. 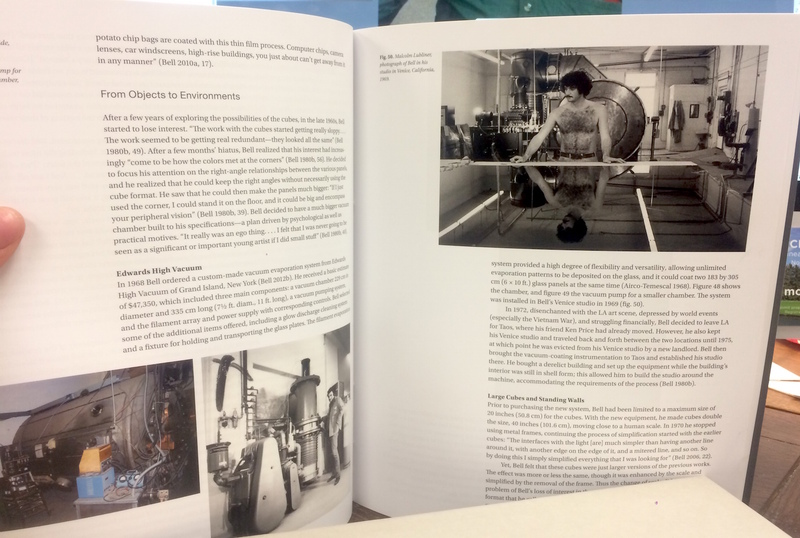 Published by the Getty Conservation Institute, 2016. The podcast has Larry’s recollection of these early years of his career. Larry’s studio is full of art, fun and whimsy. 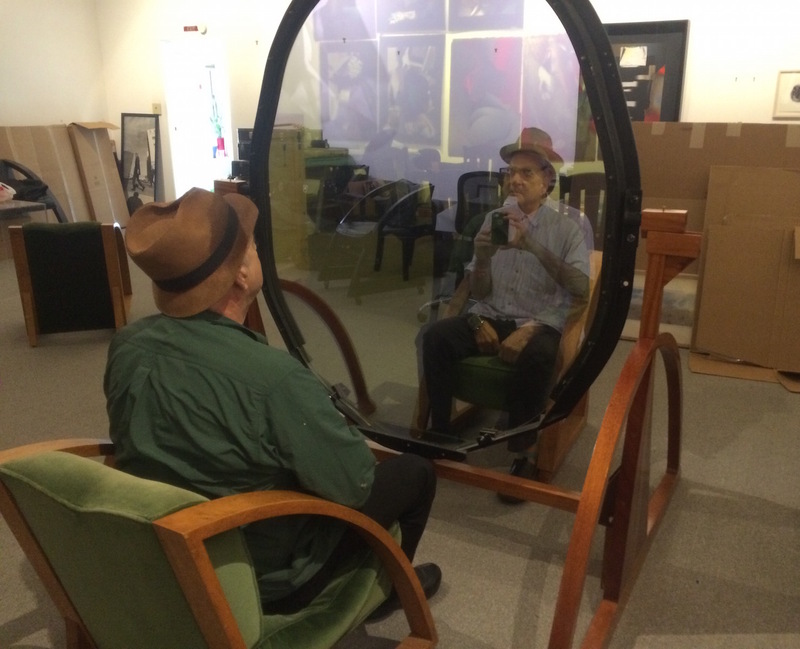 Here is a magic mirror that also plays on the balance of transparency and reflectivity. Parts of one’s image reflect and others transmit for an fun face mash-up — here we have Larry’s face, David’s glasses and a four armed ghostly figure. Fun times! But, this was not the case, I was in Basel, & it was time to play some songs! It is always lovely, & a bit unnerving to play to a room where everyone is listening intently! Intermission: Another round of food & wine, people asking questions about the lyrics! (In America….O! Why bother…) & then a second round of songs. At the end the audience would make donations in a basket on their way out the door. One night, after almost everyone had left I was asked to play ‘just one more set’ for the owner of the house & a few of his close friends. Out comes a little more wine, the house lights are turned off, some candles lit, & I sing a few more songs. One of the gentlemen who listened until the end was wearing this stunningly beautiful pin-striped suit. “How I would love to have a suit like that one day,” I thought. (in a very fairy-tale like way, this was Switzerland, after all). What kind of invention could he possibly be talking about? The tape-measure? The saw? Beer? I was dumb-founded & now doubly impressed. I still am, but there’s more. The next day the man in the beautiful suit returned. (In an Audi wagon that looked like a race-car). & in my memory he is wearing the same suit. But we know that would be impossible. Our hero would not wear the same suit two days in a row. The suit our hero would be wearing is a similar, but definitely different, equally stunning suit. Use your imagination. In his hands was a French Apple Tart. 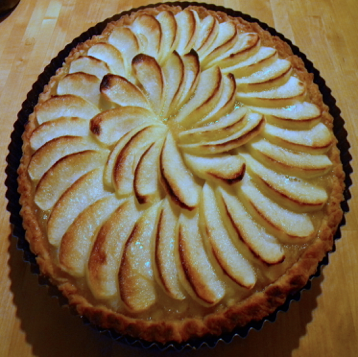 It’s always good to share an Apple Tart, though we brought a Pecan one for Larry’s Art+Tea conversation. The man in the beautiful suit, whose grandfather had invented something “every carpenter needs,” who, no doubt, never needed to carpenter, or do any work of any kind, ever in his life, was delivering to the lovely house a French Apple tart. That he had made. To thank me for playing songs the night before. My mind is forever blown. I, of course, agreed. I failed, however, to ask what the thing that “every carpenter needs,” that his grandfather had invented, was. O well. To this day I enjoy the memory & the mystery. 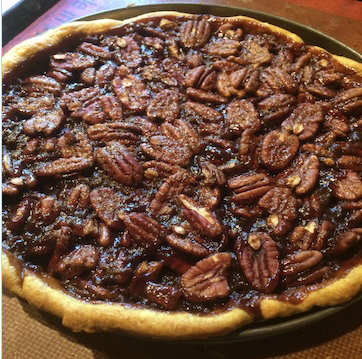 The reason I tell this story is NOT because today’s Art + Tea pastry offering is a French Apple tart, but because the ability to bake, in this case a Pecan Pie with Curry Crust, gave Liz & I entrance to the studio of the great Taos/Venice, CA artist, Larry Bell. AND, since he generously invited us back, any time we had dessert to share, the ability to bake, as I said before, will be the key to our return. Thanks to Larry Bell and Desiree Manville for inviting us into the studio!